On their Iron Bonehead split both Gra and Gnosis of the Witch offer black metal base sprinkled with occult overtones, only Gra does it in a much more mysterious manner and thus was a favorite of mine. 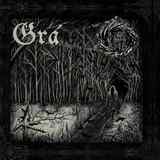 It is interesting how coming from Sweden, it is very hard to place Gra geographically, while the US players Gnosis of the Witch sound very Swedish, not to mention them using some old Scandinavian language throughout their discography. That, in a way, makes for a good marriage of two tracks on the split. On their Valitus ja kaipuu entry, Gra originally sets out on a clean, yet dejected, path, which eventually leads to suffocating dementia. Everything begins crumbling around in a distorted surround as Valitus ja kaipuu unfolds, with melodic core still trying to break through. Stumbling rhythms, persistent, evident and surprisingly warm bass guitar, nothing saves the track from the eventual claustrophobia and no escape choices. Similar to Sargeist at some level, Valitus ja kaipuu is a powerful statement, delivered vocally by Heljarmadr who recently joined Dark Funeral. Gnosis of the Witch uses their hurtful buzzsaw guitars to go on a much more straightforward full-on attack. The aforementioned Dark Funeral and Marduk come to mind when listening to Fórn Dauðaorð. There are a few melodic inflections with Fórn Dauðaorð, and, somewhat surprisingly, Fórn Dauðaorð appears to be slightly more polished in the production department than Valitus ja kaipuu, letting the Niðafjoll’s cavernous voice be heard. Yet everything with Fórn Dauðaorð is about pain, more so than mystery. Even in the slower sections guitars continue to grind and torture, cutting flesh and pulling guts out one twist at a time. There is plenty of poison and darkness to be picked up on the split, you will just have to make a choice which one you liked better.